Frankfurt, 14th March 2019 — Book a serviced apartment and save up to 54 percent in comparison to a hotel stay, depending on the DACH-destination. This is the result of the annual price radar conducted by market leader Acomodeo. In the analysis, data from 40 cities in the DACH region were collected and the average prices of the hotel booking portal HRS were compared with the average prices of the serviced apartments listed on Acomodeo for the year 2018. According to the study, the largely saturated hotel market recorded an overall price increase last year. At the same time, the market for serviced apartments continued to grow strongly and recorded mostly low overnight rates, thus putting pressure on prices in overall eight out of eleven destinations in the DACH region. In 2018, Acomodeo customers were able to save between 20 and 54 percent when booking a medium to long-term stay in a serviced apartment. 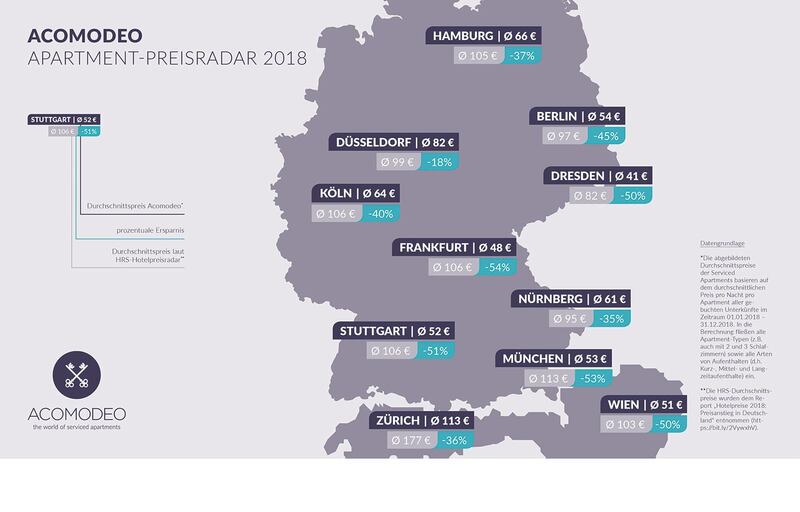 The savings potential was the highest in southern German cities: With an average price of 48 Euro per night for a serviced apartment, 54 percent could be saved in Frankfurt compared to a hotel room. 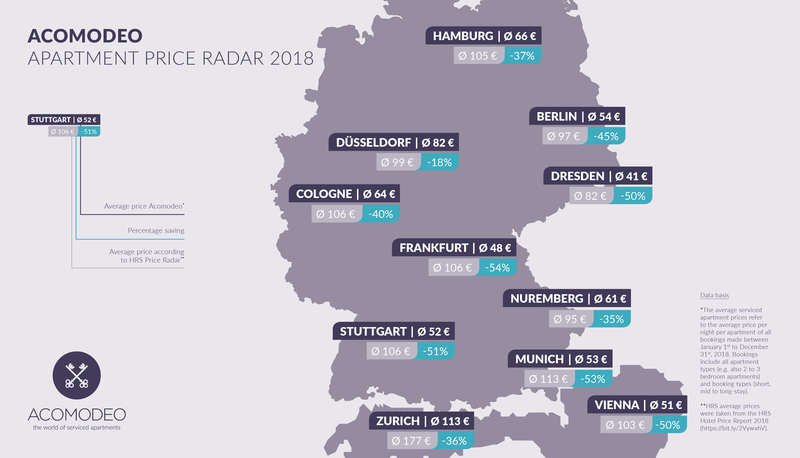 The percentual price advantage in the Bavarian capital Munich is similarly high (53 percent), although a night in a serviced apartment (53 Euro per night) is more expensive compared to a night in Frankfurt. Stuttgart also offers attractive price advantages for business travelers for long-term stays in serviced apartments (-51 percent). The cheapest prices per overnight stay are available in Dresden (41 Euro per night) where travelers can save up to 50 percent when staying in a serviced apartment. 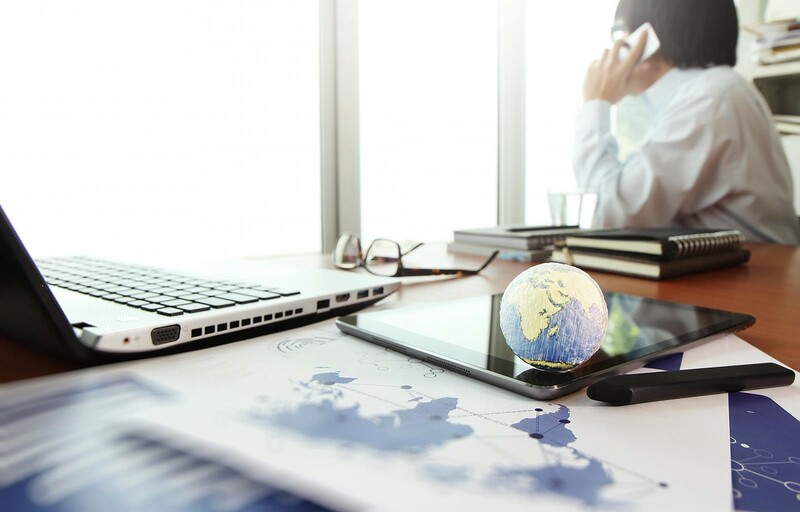 Even comparatively expensive cities such as Zurich (-36 percent), Vienna (-50 percent) and Berlin (-45 percent) offer advantageous options to save travel costs due to their extensive selection of business apartments. One of the major findings of Acomodeo's annual study was that eight of the eleven cities had recorded lower average prices compared to 2017. Only Düsseldorf, Nuremberg and Zurich recorded an increase in booking prices. In most cases, the price development can be attributed either to the market entry of new providers or to long-term price adjustments by existing providers. The newly established budget segment in particular recorded a rapid growth. It is characterized by a minimal service structure that maintains the same quality, allowing cheaper rates to be offered. Thanks to the degressive pricing model, a major characteristic of serviced apartments, the price per night decreases as the length of a stay increases. If serviced apartments are booked for a period of several weeks or even months, travelers benefit from particularly favorable conditions. Acomodeo offers such special rates online and even pre-negotiates them for companies. Next to the price advantage, the comfort of a serviced apartment is a decisive benefit for business travelers. "Especially during long stays, travelers prefer not to check in to anonymous hotel rooms. The need for an authentic living experience becomes more important as the length of their stay increases. Acomodeo offers the ideal solution for business travelers, because unlike private providers, professional payment and accounting solutions as well as numerous services corresponding to the company’s guidelines are ensured”, states Eric-Jan Krausch, founder and managing director of Acomodeo. 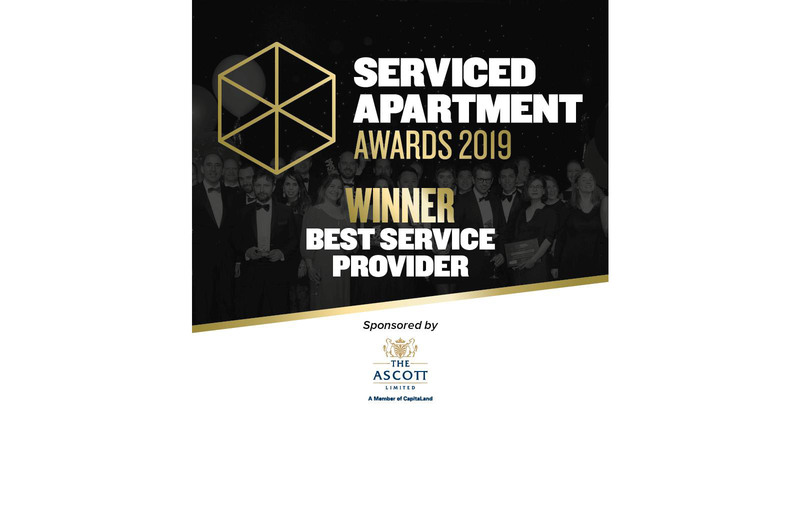 According to the latest industry report (GSAIR 2018/19), more than half of all serviced apartment providers (63 percent) acquired new apartment units last year in order to meet growing demand. In addition, three quarters of them (79 percent) plan to develop further inventory until the end of 2019. Industry experts see the strongest growth for the European serviced apartments market in Germany, Amsterdam and Dublin.